SEOUL, Aug. 9 (Yonhap) -- SK Wyverns' slugger Han Dong-min has been ruled out for three months with a torn ligament in his left foot, a gruesome injury that has cut short his breakthrough Korea Baseball Organization (KBO) season. Han suffered the injury when he stole second base against the NC Dinos at Incheon SK Happy Dream Park in Incheon on Tuesday. He slid feet first into the bag, and his left foot was bent awkwardly underneath. An initial MRI showed a torn ligament, and a second round of tests on Wednesday revealed the same. Han, who turned 28 on Wednesday, was enjoying the best season of his five-year career. He was hitting .294 with 29 home runs, 73 RBIs, 21 doubles and 64 runs scored, all of them career-highs. Han is tied for second in the KBO in home runs and 10th in the RBIs. With 37 games remaining in the schedule, Han will miss the rest of the regular season and also the postseason, should the Wyverns get there. 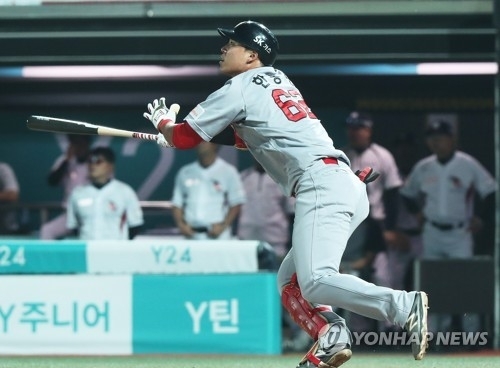 The Wyverns lead the KBO with 178 home runs, but are in the middle of a second-half swoon that has seen them drop from third place at the All-Star break to sixth at 53-53-1 (wins-losses-ties). They're three games behind the Nexen Heroes for the wild card spot.